After 5 working days everyone waits for the weekend. Sunday is the day most of us sit back at home, finish some personal work, spend some quality time with family. It is also the day which reminds us that “Tomorrow we got to go to office”. 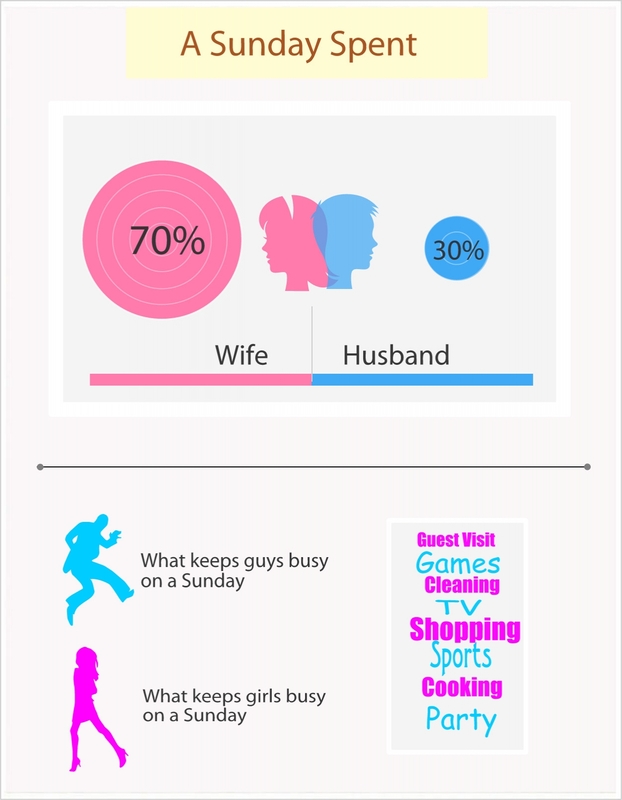 We had earlier posted an infographic (http://wp.me/p2T1CS-dx) on how a boy & girl spend their weekend before getting married. Let us see how married people spend Sunday’s. We have created an infographic and its self explanatory. We belive that the above Infographic had answered some common questions 😉 . Above and below all, this may not be the scenario at every home, we have created this based on research with a tinch of humour :P.
This entry was posted in Family, Wedding / Marriages and tagged couples, couples sunday, Family, family sunday, Husband, Lifestyle, Marriage, People, sunday, wedding, weekend, wife. Bookmark the permalink.